The granite for Graves Light came from the same Rockport, Massachusetts, quarry that provided the stone for the Bunker Hill Monument. The Rockport stoneworkers pieced together each level of the lighthouse while still at the quarry, to ensure that everything was perfect. Then the pieces were loaded aboard cargo vessels to Boston Harbor, for assembly at The Graves. 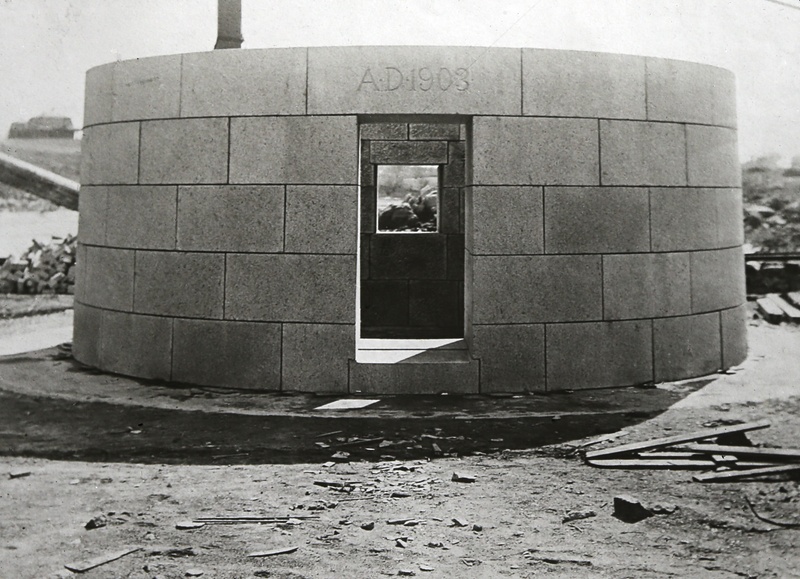 Below is an image of the assembly of the entrance level to the lighthouse, which would be installed 40 feet above the sea. The date “A.D. 1903” is carved above the door. This image and others are courtesy of the Massachusetts Historical Society. I just read the article in the Globe today (Sept 16). Super interesting stuff going on and I had forgot that you bought the light last year. I”m keen on what your doing out there to fix it up. Lots of work for sure but easily rewarding. Congrats on the renovation. This is a fantastic photograph of the lighthouse. To be able to piece together this history into one place would be part of the fun I would imagine. It would be for me. Thank you for your efforts. Thank you for taking the risk. Thank you for preserving our maritime history.